I had told myself that I needed a break from crafting after a recent stint in another MMO, but when I decided to give Everquest 2 a try so did I decide to go back to the world of crafting. I had heard that I could craft a lot of different items early in the game and that the system itself was complicated enough to keep you interested but not overwhelming. A big thanks to my son here for getting sick and keeping me home from work last week as I am now a level 18 Outfitter. I am choosing to truncate this post because I have a feeling its going to be fairly large and I don’t want it wallpapering the front page of the blog. More available after the link. Not as tedious and difficult as Vanguard but requiring more interaction and attention than Lord of the Rings or World of Warcraft. You receive your introduction to crafting as either a note in your inventory when you first start the game or from a NPC in the area where you began your character. This series of quests will introduce you to every type of crafting that is available, so its a nice series if you haven’t decided which of the professions you are going to choose. 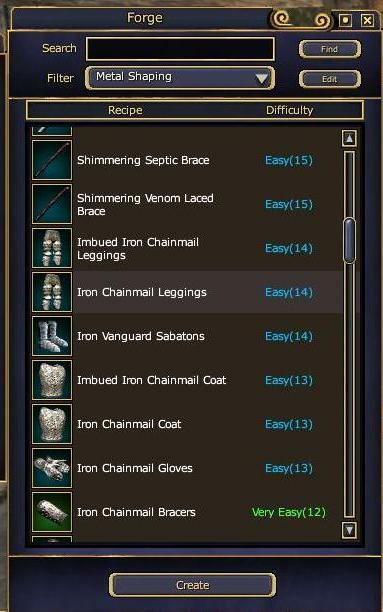 EQTraders has an excellent list of everything that you will need for these starting quests, so its a good idea to keep these items when you are out harvesting until you have had the chance to finish these quests. Trust me, its a lot easier to sit down and go through the whole line of quests at once rather than running out and finding that root you need and then coming back. If at the end of the line you still don’t know what to make, take a second to go through your recipe book. You might be amazed at the amount of items that are available to just a level 10 crafter. In fact, the amount of things you can create can be so overwhelming that there is a function available for sorting the different recipes. One of the best ways I have found to sort the recipes is by the Technique used for completing the recipe. The easiest way to do this (and I forgot the screenshot) was when you click the edit button, choose the technique from the list and highlight every level. Leave the rest unchecked and choose a name for your new sorting command. Now you will have a drop down menu choice to filter out every recipe except those that use the technique that you have chosen. A step by step guide going through the entire crafting process is available at EQtraders, and DenMother took the time and really did a great job. However, there are a couple of things I wish the in-game tutorials would have gone into more detail on that I think every beginner crafter should be aware of. 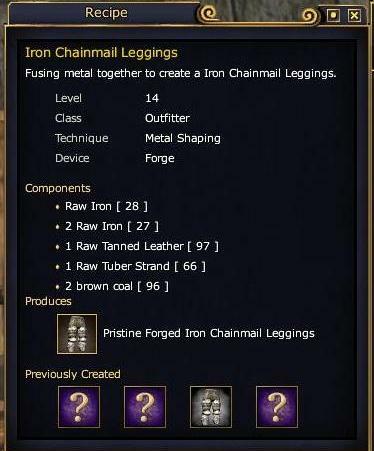 The first of these is the most important aspect of crafting in EQ2 and if someone doesn’t point it out to you or you fail to figure it out on your own, your career as a crafter will be short lived. Once you choose to become a crafter, a new section will be available in your Knowledge Book that is titled Tradeskills. 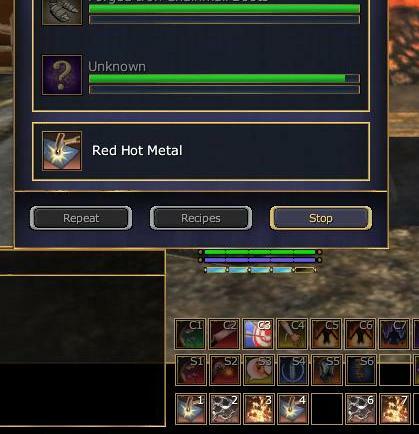 This section has a large number of new icons there that are categorized by the Technique of each crafting recipe. What these icons represent are solutions or beneficial responses to events that take place when you are crafting. If you take a look at the image to the right, you will see the cropped section of the in-process crafting window and a portion of the hotbars. What I did here was setup specific crafting hotbars for each technique that I am currently using or crafting with. This allows me to easily find the solution I need quickly when events such as “Red Hot Metal” occur. You may also notice that I have two sets of the same icons on the hotbar above. This is because as you increase in level, you gain more of these icons in which to use. I believe you gain new choices every ten levels, but don’t hold me to that as it was just something I heard in the crafting chat. One thing to note about this is that not every technique has the same number of icons. For example: Metal Shaping has three at the start, while the technique that creates metal weapons only has two. Sorting by Category in the Knowledge Book will keep these close together and easier to find. One of the biggest aggravations I had when starting out, was that I never knew what the item was going to be like until after I had crafted it. Apparently this is another new player hurdle to get past, but very easy to fix. Simply right click on the recipe you want to know more about and click examine(?). This will bring up a window similar to the one on the right here. In this window is a more detailed description of the recipe including a clear list of items needed and an icon of the end result. This icon under the “Produces” heading is what the item will be if you get a Pristine result. The four boxes on the bottom are your past crafted results and you can also check the statistics and look of these as well. This is a real help to new crafters because chances are you have limited resources at hand and want to create something that you can immediately use. If you haven’t already done so, start harvesting everything you come across when adventuring. You need to get your skills up to not only be able to harvest the next tier, but also more material per harvest. I have noticed that the higher my skill was for the particular item I was harvesting, the greater chance I had to reap 5 or 10 items per turn. I have not seen a change in the amount of rare items found with an increase in skill. If you are running into inventory issues when harvesting, be sure to read all the way to the bottom and check out my tip for new players, it especially pertains to this problem. With the addition of the Echoes of Faydwer expansion to the game came two additional crafting skills. These are Transmuting and Tinkering. Any player who has this expansion and is level 10 or higher in crafting can choose to become a Tinkerer or Transmuter. This is completely separate from your current crafting profession but only one of the above may be chosen. While I have yet to really delve into this skill, there are some great places to learn more about Transmuting and Tinkering. Learning about this part of crafting did not come easy because if you choose to start in a city like Freeport, chances are you are not going to hear much about it. I think this is because of the fact it is only a part of the EoF content and also because learning either of these skills requires you to make a bit of a trek to the area called Butcherblock Mountains. I was lucky enough to come across a great player named Ulsalam who guided me through the steps to reach this area. East freeport has a NPC on the docks who offers tickets to Nektulos Forest. These docks have a boat that arrives and will transport you to the docks of Butcherblock. Once in BB, talk to Tyla Maki and Sala Maki. Tyla has the information on how to learn Transmuting (a brief dialogue) and then Sala has the books. Its seems like crafting and the abilities you buy are exactly like the ones used when crafting and there are only four so grabbed them all at 19s a piece. I also grabbed the first three volumes in case I needed them later. If you are unable to go to BB because of your alignment, you can try speaking to Ebnix Cogsworth in the city of Kelethin in Greater Fayedark. If you read this far then Bravo! You must really be interested in crafting in EQ2. If you are as new to the world of Everquest as I am then there is one thing about the world you may not know but be particularly interested to hear. When visiting a bank for the first time, you may have been a little disappointed at the amount of space you had available. Its understandable. Its barely larger than the pack you started with! Did you know that you can take any bag and place it in that bank ( shared or private) and place items in those bags? I believe its Shift+B to open your bank bags. This also applies to your House Vault. Bask in the glory of Inventory Heaven! lol. Where was this post 4 days ago? I just wrote today about how I just figured out crafting over the weekend. I was just starting my combines and letting it go… and then cursing my bad luck at the high number of failures I had. Discovering the tradeskill abilities in my knowledge book happened more as a fluke than anything. Good stuff in this post. There was a lot that I had figured out over time, but some that I didn’t know. I used to use EQtraders religiously back in the days of EQ1, but I haven’t visited it for EQ2 yet. You are right though… DenMother has always been an excellent source for anything crafting in Norrath. I don’t know how it is at the Freeport dock as I haven’t been there since just after launch, but I’ll let you in on a little shortcut that a friend showed me. At the Qeynos Harbor, there is a flying carpet. If you hold your mouse over it, it says “The Sinking Sands.” If you click on it, it will take you to a zone from the Desert of Flames expansion. You then walk down the bridge you appear on and there is a little tent set up with merchants. There is another carpet on the ground. You can right click it and there is an option to return to Butcherblock. Personally, I enjoy riding the boats. I made a ton of friends while riding the boats in EQ1, but on occasion, I am in a hurry. In those instances, I take the shortcut because it is free and just takes a couple of clicks to make the trip. One thing many new crafters do not realize as well is that each crafting skill usually has an effect either on quality or progress. Each crafting event requires a balance of both in order to create the best product. Many crafters set up a balance of skills in their hotbars to address both areas as they progress. Alali, you are talking about the “reaction arts” (as denmother calls them)? I can see and understand why you might want to use the progress ones over the durability ones, but I have yet to have a consistency with using either. I guess it is all a roll of the dice, as I see it in my windows with critical successes and failures, and still comes down to a bit of luck when going for that pristine. One thing I like about this system is the way the add the bonus experience for first time pristine creations. Since I found that I have made an effort to go through and craft everything from the level 1 forward to pristine atleast once for that bonus. I think it has definitely helped my progression. What a blast from the past. Hopefully you and everyone reading this has moved onto Warhammer Online by now.